This wedding season, our lovely dulhans can sport these stunning mehndi designs on their hands and feet! The great-grand Indian wedding season is here! So, shopping for your bridal lehenga, pre and post wedding outfits must already be in full swing. All the rounds to the famous and designer showrooms as well as making your bookings online must be also keeping you busy. But, in the middle of all this, don’t forget to book your mehndi artist. One of the most important occasions is a mehndi/sangeet night. So, Zuri is simplifying your life by presenting to you 22 beautiful, intricate as well as simple mehndi designs. All you gorgeous dulhans out there, take a look at these mind-blowing mehndi designs and shortlist from this stunning compilation right away. The age-old tradition of wearing mehndi on hands, arms (at times beyond one’s elbow), feet and legs gives dulhan a complete bridal look. A typical dulhan mehndi design is intricate. It usually focuses on Indian traditional motifs and symbols such as the contemporary Indian bride and groom couple, shehnai (Indian flute), Lord Ganesha, groom’s name, palanquin, floral vines, hearts, a pair of lovely swans, elephant, peacocks and paisleys. These symbols are not just auspicious, but conventional too. Paisleys are timeless and elegant. Floral designs can be simple to more elaborate, with the addition of extravagant strokes of tiny leaves, the design becomes even more intricate. If you are looking for a bit of a quirk, go for magnificent Indian architectural motifs, such as Mughal domes, rectangular pillars, chequered artwork, split windows and doors (dwars). Some brides prefer minimalist (rather simple) designs. Arabic mehndi fits in well for such dulhans. 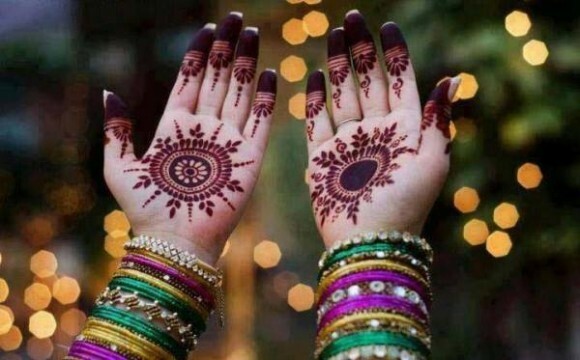 Known for it’s simple style, spaced out pattern, and add-ons such as sparkles, glitter, stones and crystals, Arabic mehndi can be customized to a large extent. The colorful embellishments are meant to glorify the bridal attire. So if you are nearing your wedding date, Zuri recommends you decide on the mehndi design as soon as possible. Share a few shortlisted ideas with your mehdni artist, take their feedback and customize the design as per the color of your lehenga/outfits and makeup.